What do you get when you put a great idea together with a poorly thought-out layout? The Mother-Daughter Book Club. Shireen Dodson really put together a great guide to help busy moms stay connected with their daughters through a book club. Ideas are offered about group size, discussion style, activities, and a list of books (Dodson’s second book, 100 Books for Girls to Grow On, is meant as a companion volume so the “official” book list in TMDBC is limited to fifteen titles). Dodson really tries to show how mothers and daughters can remain close and broach difficult topics using a bookclub as medium. The girls from Dodson’s two groups (one for each of her daughters since they are far enough apart in age that the bookclubs didn’t overlap) all contributed little bios that were sprinkled throughout the book. The “throughout” is the problem. Not only are the bios sprinkled in between sections of chapters, there are little bulleted tips, short quotes, and paeans to reading from authors and educators (with reading lists) inserted in the middle of sentences. It’s really hard to easily read this book because Dodson’s thoughts and sentences are continually interrupted by all this other “stuff” – while the “stuff” is nice it gets in the way. I really think the editor/designer should have been more careful with the layout of the book because it hurts Dodson’s message and makes it less likely for a busy mom* to make it all the way through the book. *I’m not a mom but I have three nieces and I’m pretty sure my SIL would qualify as a “busy mom” – I’m thinking she wouldn’t slowly try to piece this book together; she’d just go read something else because her “alone time” is severly limited right now. I ran across Stuff: Compulsive Hoarding and the Meaning of Things in the new issue of Bookmarks magazine. I find compulsive hoarding is an interesting issue because my entire family consists of packrats – two packrats got married, had three more little packrats, and two of them married packrats so I get it from all sides. The major difference is that we packrats are able to sort and discard items we no longer want or need while hoarders seem unable to part with anything….even trash which is a major health issue (and gross, ew). I am quite fascinated with the whys of hoarders (if Hoarders or Hoarding: Buried Alive episodes are anywhere on TV I will watch them) so I downloaded Stuff to my nook. Stuff is a pretty quick read, clocking in at only about 200 pages. Professors Randy Frost and Gail Steketee open their analysis of hoarding disorders with the (in)famous case of the Collyer brothers, Homer and Langley (the pair formed the basis of E.L. Doctorow’s novel); New York legends, the brothers’ bodies had to be excavated from the debris that filled their townhouse. Frost’s first “real life” hoarding case, Irene, is profiled in the first chapter and her struggles with her hoard and her illness are used as touchstones throughout the book. Some of the hoarders profiled hoard paper, others clothes, and a few garbage/bodily waste; others display symptoms of obsessive-compulsive disorder, contamination issues, and processing disorders. Frost and Steketee do a great job in making the Stuff accessible to both laypersons and scientists. The language of the book is not complicated but care is taken to use scientific data when discussing possible reasons for hoarding. The results of many biological and psychological studies, including those of Frost and Steketee, are discussed when working through treatment options for hoarders. From their work with hoarders, Frost and Steketee are finding that hoarders develop an emotional attachment to every little piece of their hoard (to retain memories, certain feelings, etc. ); parting with even the smallest scrap of paper has huge emotional and psychological implications. Hoarders “see” objects differently than the rest of us. One thing made very clear throughout the book is that hoarding, like any other psychological illness, can only be treated if the hoarder is willing to undergo treatment. The treatment process is long and emotionally very intense. At the very end of the book, the authors included a section on ways for hoarders and their families to find help; support groups mentioned frequently in the book include Overcoming Hoarding Together and Children of Hoarders. The authors of Stuff do urge those affected by hoarding to seek help. I very much enjoyed reading Stuff both for the information contained within and the empathy shown by Frost and Steketee toward their clients. So who wouldn’t want to live in a museum filled with really cool stuff like Michaelangelo sculptures and Tudor furniture? I wouldn’t mind, although, having a skinny-dip in the Met fountain to fish for spare change might bring me up short. From the Mixed-up Files of Mrs. Basil E. Frankweiler is a book that somehow missed my reading years. I’m not quite sure why I never read it and I certainly had the opportunity since it was published in the 1967, well before I learned to read. Maybe the reason had to do with the title because it is quite a mouthful but more appealing than Claudia and Jamie Runaway to the Museum or something like that. I started my Newbery Project just so I can fill in some of the gaps. FtMuFoMBEF (what a name) is such a fun book to read and the pen-and-ink illustrations are perfect. As an oldest child myself I could really sympathize with Claudia; it really stinks when you’re always the one to have to set the table, or watch the youngest kid, or help with the laundry (with 20-20 hindsight, I realize no one would want the kid who would live in the same clothes for weeks if given the opportunity to come within 10 feet of the laundry basket). You’re always the role model and it does stink that no one recognizes you for it; in reality, my mom was pretty good at thanking me but it was still irritating that the little bros got to watch TV and I got to load the dishwasher. The sibling interaction between Claudia and Jamie was pretty cute, especially Jamie with his miserly/practical ways, even though the kids did sound more like a retirement-age “Odd Couple” at times instead of school-aged siblings. The “Angel” plot was a bit of a stretch but it did lead to a situation that allowed Claudia to go home “different” since that was her object in planning the sojurn in the Museum. I found plenty of vocabulary words in this Newbery winner. I think I could have figured out many of them from context but I could see some winding up on vocab or spelling lists for middle school students. Next up for my Newbery Project is Dear Mr. Henshaw. When I read Rebecca’s review of Click and her personal “click” moment when she realized she was a feminist I knew I had to read Click, too. I read Manifesta when it was first published in 2000; I was wandering the University bookstore and it caught my attention. I liked it but I wasn’t caring too much about anything at the time; I had just turned twenty-one, my engagement had broken down, and I had failed to get into medical school like I planned so I didn’t feel the pull of a feminist call-to-arms. I felt like I had failed to beat the boys in the game of admissions, I hadn’t studied enough, wasn’t serious enough. So I picked up the pieces and moved on; I gave my copy of Manifesta to a friend and lost track of who had it after several changes-of-address. Ten years later, I am also ten years wiser. I still didn’t get into medical school but I did acquire a graduate degree which led to a job which allows me to live comfortably on my own. Whew, I wouldn’t be doing that if I’d gone to medical school. I started reading books again after finishing my thesis which led to this little blog and then a little Twitter which led me to Rebecca and then to Click. I wanted to read those personal stories from women, really wanted to see if there was anyone like me within the pages. “Me” being quite heteronormative and boring in her life of books, yarn, and cats, but every once-in-a-while I’d get accused of being a wolf (man-hating, flannel-wearing, butch, status-quo busting, liberal lesbian) in sheep’s clothing (man-tolerating, stiletto-wearing, long-haired, status-quo shattering, liberal woman). Usually by some red-neck, hick male who had been told to stop looking down my shirt. Feminists come in all shapes, colors, and genders, and it’s about time that our diversity is recognized in the mainstream. If there’s a movement whose image shouldn’t be the top priority, it’s feminism (p 32). Li Sydney Cornfeld writes eloquently of her experiences as a LD/ADHD feminist; Anitra Cottledge writes of creating her own feminist curriculum when none would fit her identity as both a black woman and a feminist. Rachel Shukert wrote what is my favorite essay – her “click” moment comes in the aftermath of Kurt Cobain’s death, a realization that comes in a confrontation with her “group”. The contributors were so diverse in background and experience they really did mirror Nellie’s thoughts on diversity. Some moments of revelation were earth-shattering, some came from a gradual change in perception. All are amazing essays from intelligent and articulate women (and one man, Jordan Berg Powers, who has a pretty cool mom). Which brings me to my “click” moment….and I have to confess that I don’t have a single moment where the lightbulb just popped on. I have thousands of tiny ones, like Christmas lights. My father, who taught me to play baseball and expected me to go to college, and my mother, who taught me to balance a checkbook and do the laundry properly, contributed most of them. My grandmother, who taught me that you have to put on a brave face even when you feel like an old shoe and your hair is falling out from chemo, added some. I was never told that some things are “only” for boys or girls; I had Barbies and Cabbage Patch Kids, went to dance and piano lessons, and wished for curly hair but I also read the family medical book cover to cover and was allowed to purchase a weighty (adult) book on dinosaurs after a trip to the Field Museum in Chicago (I was suddenly taken with the idea of being a paleontologist at the age of eight – then I learned you have to dig the dinosaur bones out of the rocks yourself if you’re a paleontologist; I sunburn easily). On the flip side, my brothers had Cabbage Patch Kids and piano lessons, too, and I dressed them up in my old dance costumes for playtime; Mom has pictures of Christopher wearing my lion costume complete with tutu, ruff, and tail (snicker, snicker). I watched as boys harassed other girls who developed early and was quite thankful that by the time I filled out the boys had tired of this past-time (my father did teach me self-defense about this time; dancers have strong legs). I passed on the expense and overly feminized atmosphere of sororities in college and was instead invited to join a co-ed professional fraternity, Alpha Chi Sigma, where I held all sorts of chapter offices and which I still serve as a District Counselor (AXS, founded in 1902, went co-ed in 1971). I learned that life does not end when you mutually agree with your fiancee that getting married is probably not going to turn out well and you will not die of embarrassment when you have to tell your relatives. Life also gets much better when offered a job with a salary which will allow you to buy a home as a single woman without a co-signer. Now that I’m “Aunt Missy” I find myself buying my favorite books for my three nieces and being pleased that not only do they like Angelina Ballerina but they also play with our old Playskool barn and garage (“uh, oh! car crash!”). I have no way of knowing whether Click would have impressed me as much ten years ago as it does today, if I had read it instead of Manifesta. Click is a very personal book, one that encourages each of us to tell our story, but I don’t remember Manifesta feeling so personal. I guess I need a new copy of Manifesta so Click has company on the bookshelf. The twins were completely uninterested in my knitting – they were busy sending Cookie Monster into outer space. 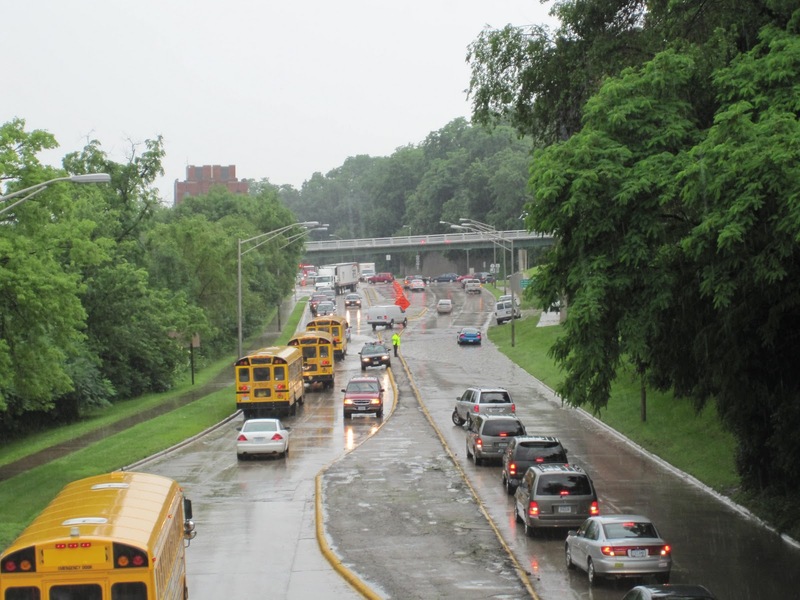 The driver of the small blue car (near the center – in the middle of the puddle) tried to do exactly what you’re not supposed to do when there’s water over the roadway…he or she got the car stalled when they tried to drive through the water. So not only did the police have to re-route traffic through the shallow part of the flooding they also had to have the blue car towed away. That’s a very large tree blocking 23rd Ave; the bus had to turn around and go back. 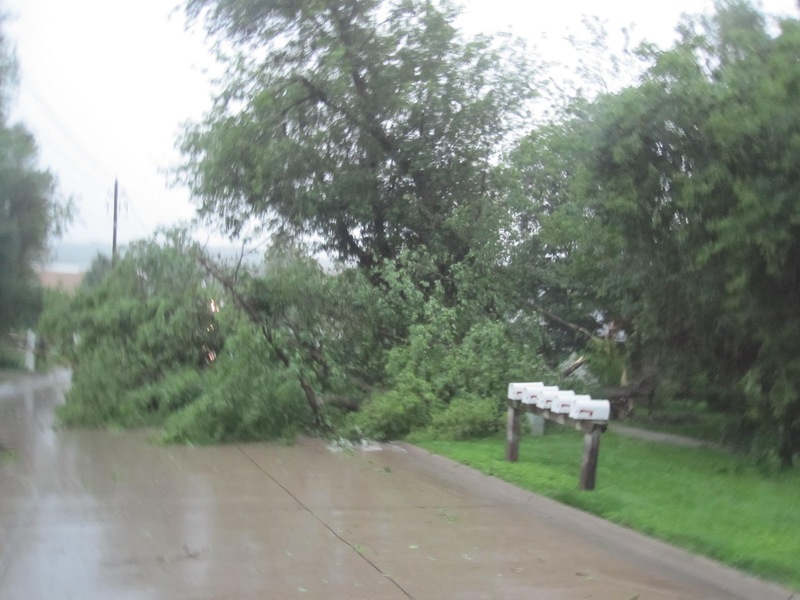 We had a ton of downed trees due to straight-line winds estimated at 70-80 mph – yikes! I must have looked like the most unperturbed person in the world, knitting away on my shawl while everyone freaked out. 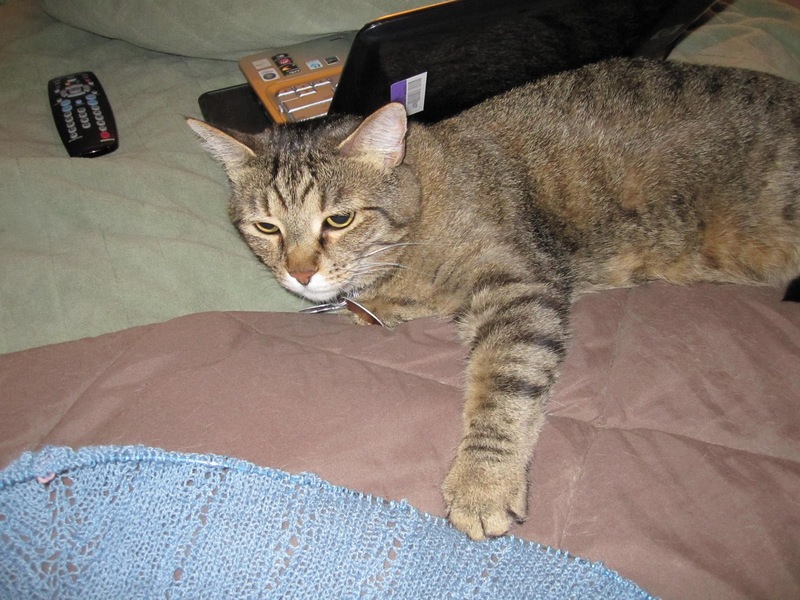 However, a few words of wisdom: never interrupt a knitter when she’s counting. 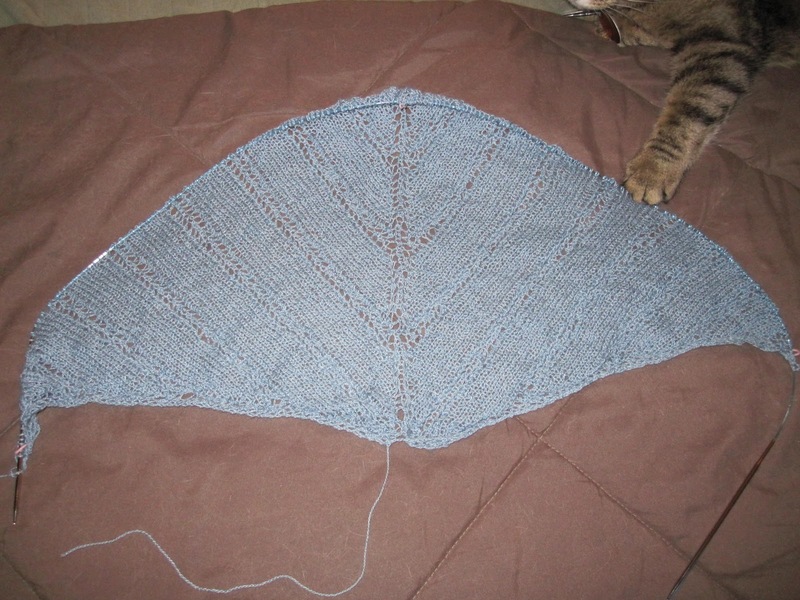 The shawl will get much wider faster than it will length-wise so I switched from a 24″ circular to a 40″ circular. This is the easy part of the “Icarus” pattern, very easily memorized. The “feather” portion on charts 2, 3, and 4 will be far more complicated and with longer rows. Chaucer is doing a very good job of “helping” me take a picture! 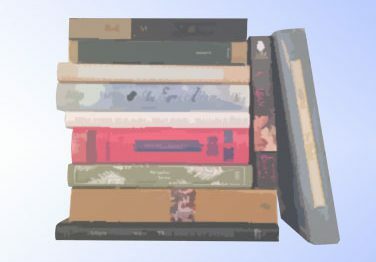 I have a large backlog of book reviews to finish – they might have backdates (sorry) since I’m that far behind. But I am still reading – I didn’t just KIP all week. BNBC went all digital for this month’s First Look Book Club – all advance copies of Corinne Demas’s new novel The Writing Circle were “handed” out via our digital accounts. I got to read it on my nook; talk about convenient since I didn’t have to track a physical copy down at the UPS depot (pain in my tail, let me tell you). The Writing Circle has an interesting set-up: a woman (Nancy) working on a very personal novel is invited to join a writing group made up of (mostly) established writers in several genres (The Leopardis) as a replacement for the group’s original coordinator, Helene (who, unfortunately, died before the novel started). From there, the narrative of the story is shared between the members of the group, with a few non-group narrators, using a limited third-person point-of-view and this allows us to see the interpersonal relationships/problems of the group without too much exposition. I have an affinity for novels written using multiple narrators because a) you get more perspectives and b) you have to decide which person has the most “reliable” voice. I can’t discuss much more of the plot because it would give too much away; I will say I was surprised to see the novel head in the direction it did. The structure of the novel with the shared narration among seven or eight characters did not lend itself to the climax of the novel which was essentially between two chracters. I think at least one character from the group gets left behind in the narration; because the plot moves in an entirely different direction, his personal story (started near the beginning of the book and remaining oustide the writing group) becomes superfluous and peters out without any sense of resolution. Demas has a very descriptive style and she does a great job setting up each member of the circle; the group members are all distinctly different from one another, so it seems a little too diverse a group at times, but at least I didn’t get them confused. The beginning of the novel is a bit ho-hum but Demas’s strongest writing comes near the end of the novel and those two or three chapters are so strong, in my opinion, that they could really stand alone as a short story or novella. We had a great FLBC discussion about several issues raised in the book (the idea of “trust” in a writing circle was important), the best discussion related to a plot point I can’t talk about here because that would really give the plot away (sorry, but it’s a new book and I’m not going to spoil the story just for the sake of review). The Writing Circle will arrive in bookstores on July 6 so check it out. I have to admit – the first time I saw The Gentle Art of Domesticity by Jane Brocket sitting on the store shelf I went, “Oh dear, another pink book about how nice it is to stay home” and didn’t give it much thought. Over the past year or so I braved opening the pink jacket (I’m not much of a pink person) and flipped through it. It seemed more like a book about inspiration in your creative life…hmmmmm….I recently found a bargain copy and decided to buy it. I’m glad I did – this was a really fun book to read/peruse. The basis for The Gentle Art of Domesticity is Brocket’s blog yarnstorm (now found here, her author site is here), started in 2005 to write about knitting and everything else she liked to see or do. In her introduction Brocket makes the distinction between “domesticated” – meaning the scut work of cleaning, scrubbing, laundry, etc. – and “domesticity” which is the fun stuff like baking, knitting, gardening…in short, creating. 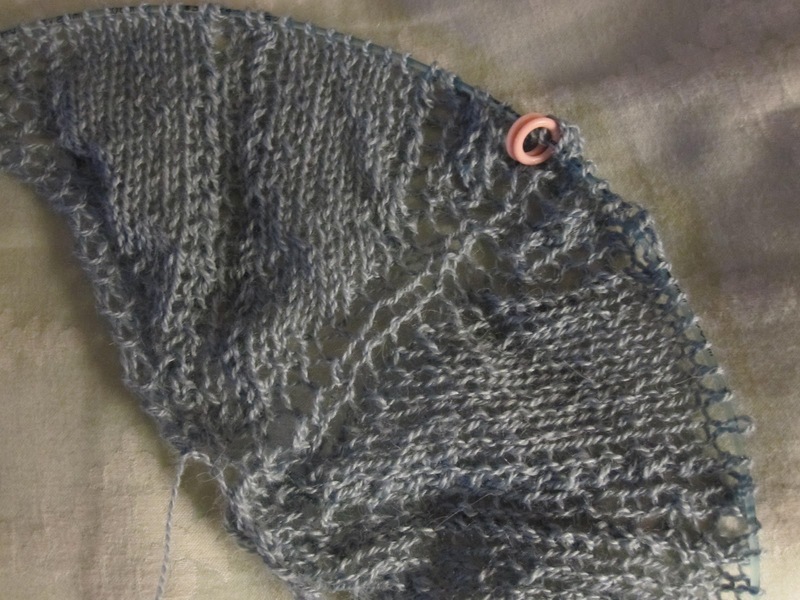 Which I kind of like because if faced with a nauseatingly difficult lace knitting project or folding the laundry, I’ll take the lace knitting over the laundry any day (I can always fish clean knickers out of the basket if necessary; the lace won’t knit itself, haha). 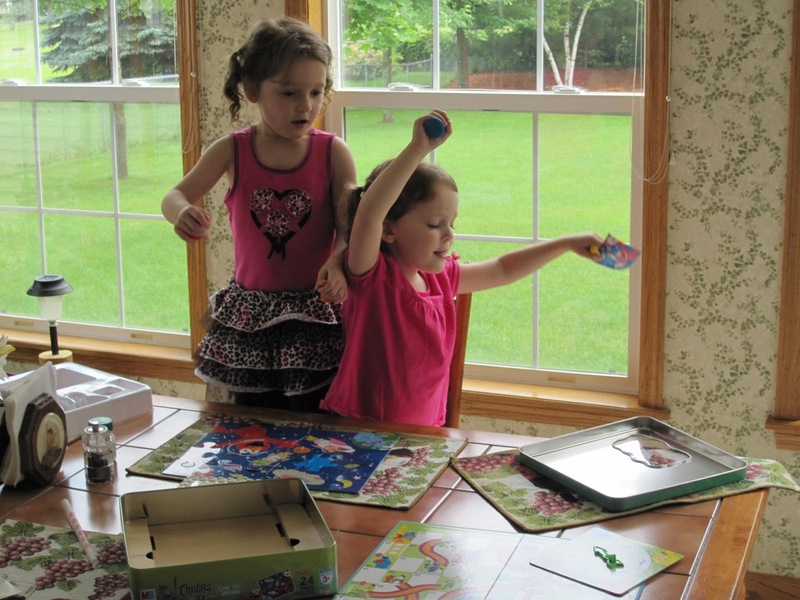 She creates a lot in her life – yummy cakes, colorful quilts, lush garden plots, flashy socks. She writes a great deal about the inspiration for her crafts, from books to paintings (the book shows some great scenes of knitting circles), movies to toenail polish, and garden colors translated into a quilt. Brocket also takes beautiful pictures of all the things she loves to create, making me quite jealous because my pictures never come out the way I think they will. The book is worth the pictures alone – if you don’t believe me check out her blog; the post about lettuces is a prime example. She also writes wonderfully about her children and husband who like to help her with her creative endeavors and have learned from her example. I think a considerable amount of her creativity comes from having the time to observe and plan (although, I think one could make the argument that she has “made” time for herself since she does have kiddos to care for). If I had her time – instead of squeezing knitting and sewing in along side vaccuuming the cat fur out of the furnishings when I get home from working 60+ hours per week – who knows what I’d create. I had a lot of fun reading this book – all the entries and pictures are a testament to finding activities you love to do and sharing that love with others. Knitting outside today was a wash. Literally. We had rain all morning meaning the event at the Farmer’s Market (even though sheltering in the parking ramp) was not in my future. 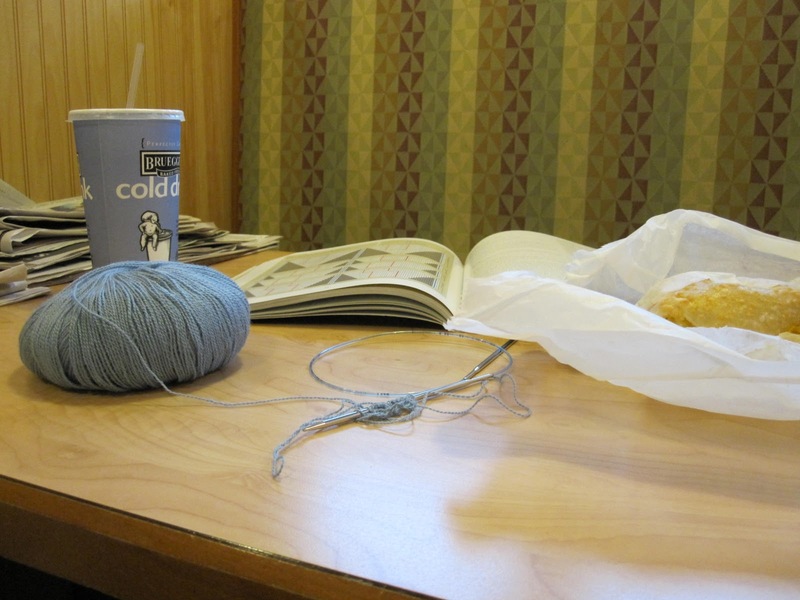 So I started my KIP day at Bruegger’s with a bagel sandwich and a cast-on. I decided to set aside my blue sweater (which sheds everywhere) for a more summer-y project. 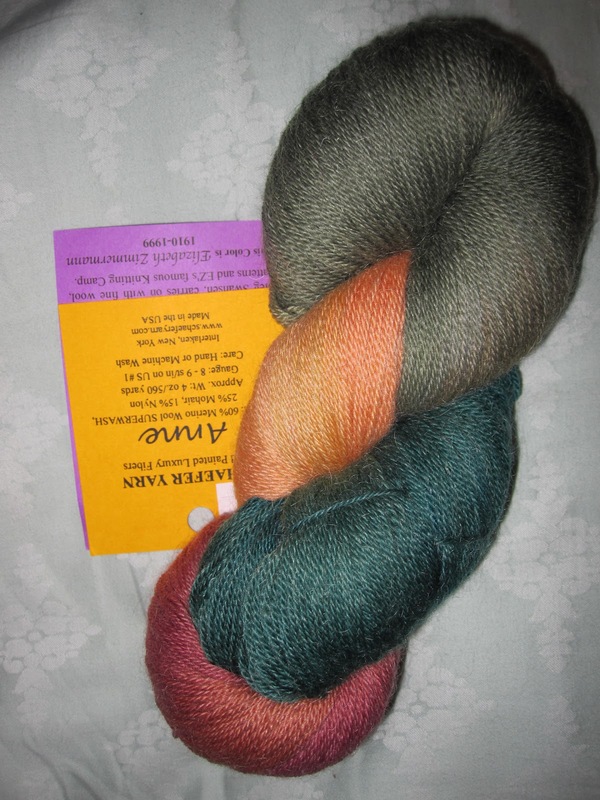 Hence, Icarus (Miriam Felton’s “Icarus Shawl” from The Best of Interweave Knits). 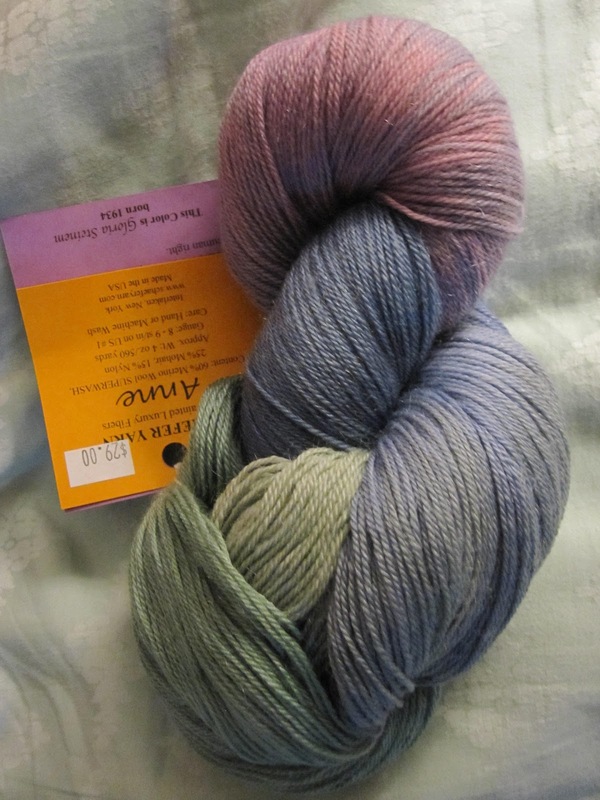 I have some super-pretty blue “Silky Alpaca Lace” from Classic Elite Yarns. Yay! Then I went to The Knitting Shoppe (of course, since knitting in public was kind of a bust) intending to get some stitch markers then leave…but I was captured by sock yarn. Again. and “Elizabeth Zimmerman”. Then I stayed to knit and chat with some of the other ladies (and spoil Milo, a therapy-pug-in-training who was visiting the shop with his human). Then I went to work where I KIP’d in the breakroom. And now I’m home. Don’t forget to KIP all week!